W.A.G. is a social and educational self-help group. It is fully inclusive and open to anyone within the community and aim to encourage its members to achieve their goals in art. The membership is made up of a very wide spectrum of abilities from beginners to the more experienced. 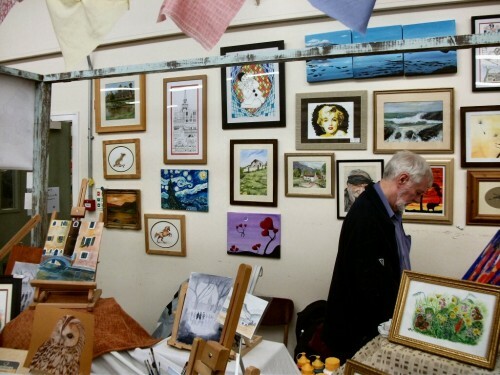 The media used is mainly watercolour but there are frequent sessions featuring Acrylics, Pastels, Drawing and other art media. The group invites an artist/tutor to complete a demo or lesson every third week where they are taught skills that they can then practise during the other weeks. Now based at the John Holt Centre on Birch Avenue in Washacre (BL5 2NR) since 2017, the group meets for a 3-hour creative session on Mondays at 9:30am until 12:30pm. Originally based at Westhoughton Learning Centre, the first meeting was 6th September 2010; the group has grown 'organically' over the years with friends of friends joining. New members are welcome however places are limited due to venue/class sizes - due to popularity and demand for additional art sessions, a spin-off group 'Art By Elise' is now up and running (see below). Accumulated over its existence, there is a burgeoning collection of artwork from our students which the group has been able to display at community events and at their very own art exhibitions. A self-financing, self-help group with over 30 members, W.A.G. will continue to build links with both the local community in Westhoughton and the art community in Bolton and Greater Manchester. The group also raises funds for Macmillan Cancer Support. 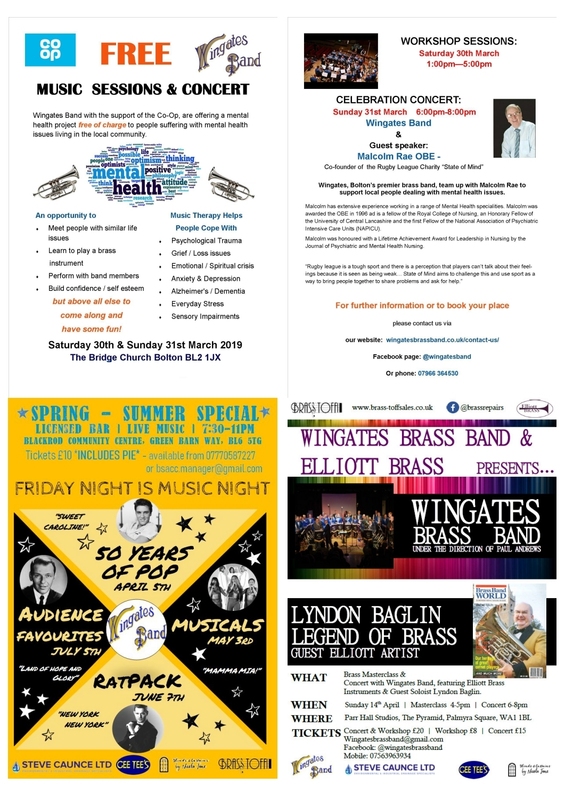 To raise awareness though publicity and word of mouth; raise funds for equipment for possible future exhibitions, and to encourage and support art provision in Westhoughton. A founder member of WCN, the group aims to connect with other groups with a goal of growing the group and accessing resources and facilities, e.g., storage; and also to discover what groups and interests are covered in Westhoughton, and contribute to community life in the town. 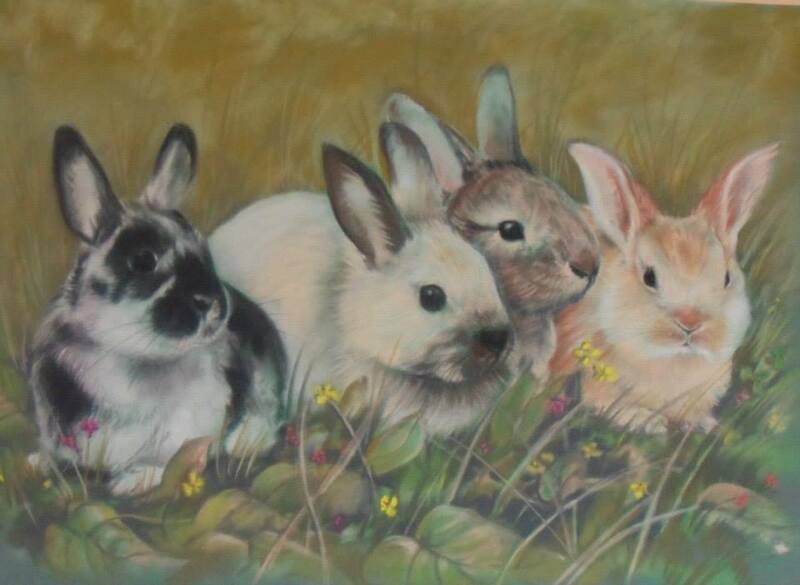 March and April 2018 saw two back-to-back exhibitions: that of Westhoughton Art Group, followed by sister group Art By Elise'. The former being the sixth since the inaugural display of student art back in 2012. These popular shows allow the public to view the work of the students, showing the variety of styles and techniques of the artists, with work on display by both newcomers and the more experienced. The quality is high and feedback very encouraging - the exhibits showing the development and passion of the group, and feature 'live sessions' as artists show their technique and can be approached for advice and tips. 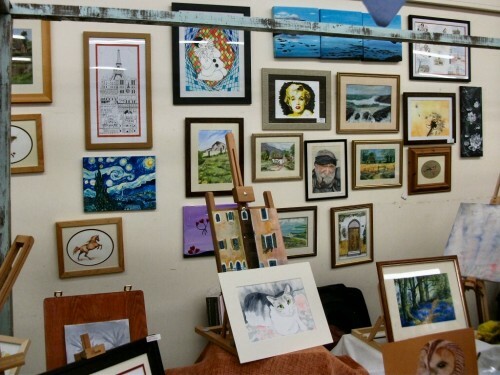 With some artwork for sale, these exhibitions are a good place to pick up unique pieces of art to display at home or in a workplace. 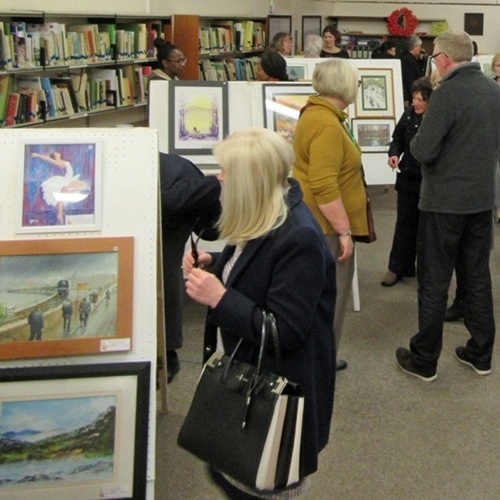 The 2019 art exhibition takes place from 7th March until the end of the month, again upstairs at the Library with occasional weekend live demonstrations. 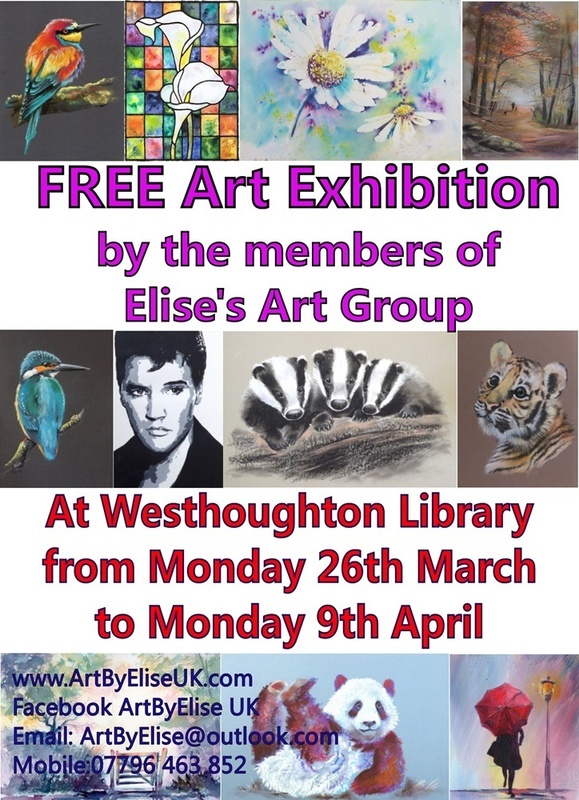 The exhibition will feature art from both Westhoughton Art Group and Art By Elise classes. Do visit, its free; some art will be available for sale. An exhibition that always enthrals and never disappoints. Westhoughton Library is open from 9:00am to 5:30pm. Closed Wednesday and Sunday. Late opening to 7:00pm on Tuesday and Thursday. More info 01942 634640. 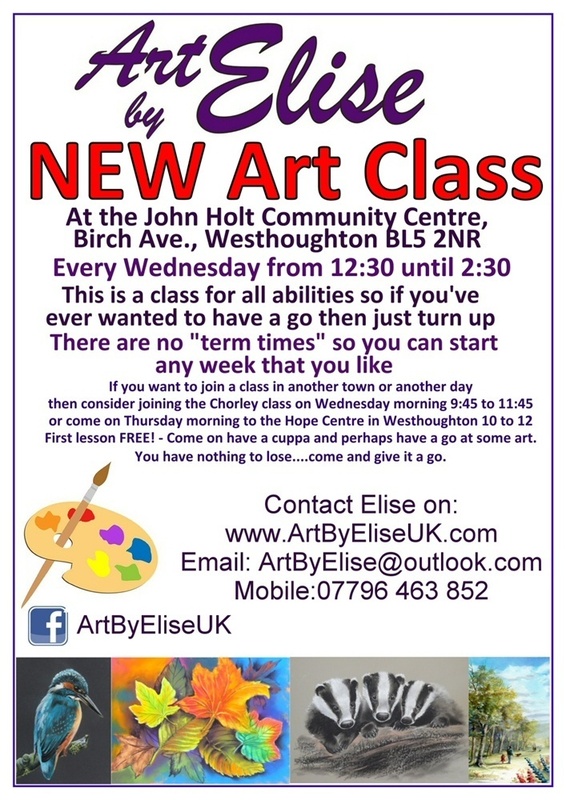 One of the former students at W.A.G., Elise Hendry, has developed her art and is now teaching students in her own right, running 2-hour classes at the John Holt Centre, Birch Avenue, Westhoughton, Wednesdays between 12:30pm and 2:30pm; another at Hope Centre, Central Drive, Westhoughton, Thursdays 10:00am to 12:00pm; with a further class Wednesday mornings 9:45am to 11:45am at Lancaster Way Community Centre, Buckshaw Village, Chorley. These classes are open to people of all abilities, and cover a variety of styles and techniques There is no 'term-time' so you can start any week. 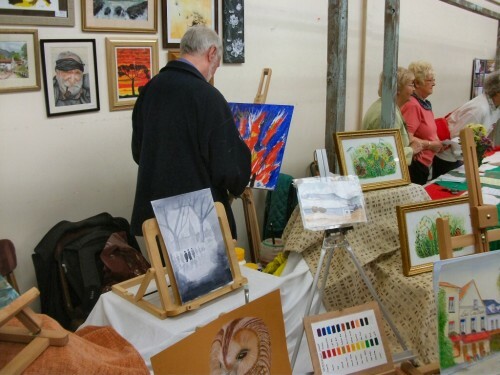 Pop along, get started and develop your artistic skills - no pressure and fun. First taster lesson is free. Flyer. 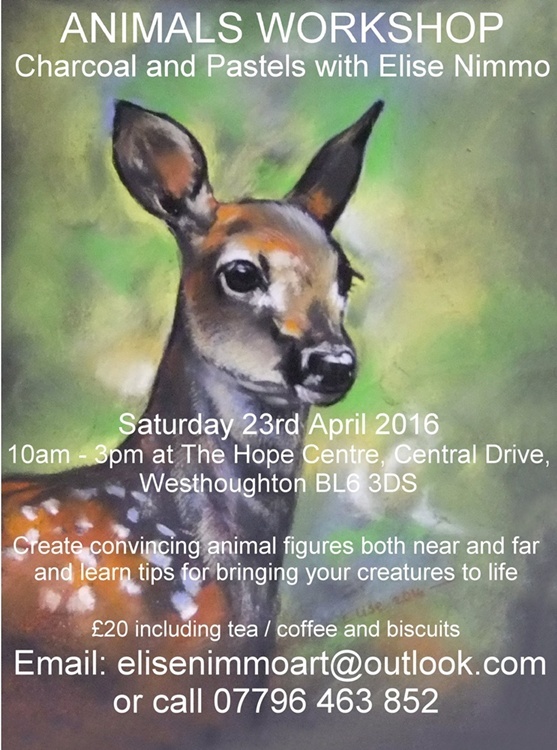 Watch out for occasional day-courses - such as the 'Charcoal and Pastel Workshop' - offering a chance to develop your art skills run by Elise Hendry, here students were given tips and techniques on how to create convincing animal figures, bringing your creatures to life. For more information on classes or courses call 07796 463852 or email Elise Hendry or visit the Art by Elise website.